Ugandan MP says he is fighting for the oppressed – Kenyatta University TV (KUTV). All Rights Reserved. 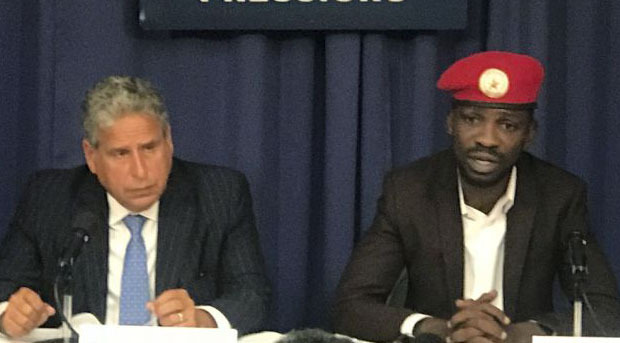 Ugandan pop star-turned-lawmaker Bobi Wine said on Thursday he would return to Uganda to continue his struggle on behalf of “the oppressed” after allegedly being tortured by members of the presidential guard. Ssentamu’s driver, Yasin Kawuma, was shot dead on Aug. 13 following an incident in which the president’s motorcade was pelted with stones. The next day Ssentamu himself was arrested and detained for several days during which he alleges his testicles were squeezed and a kidney was injured as soldiers beat him repeatedly. Speaking at the National Press Club in Washington, Ssentamu said he got “injections that I don’t know about” and that the skin on his hands keeps peeling off. “All I know is I am still alive as of now,” he said. Ugandan authorities vehemently deny the torture allegations. Ssentamu’s arrest sparked protests in Kampala by supporters demanding his release, with scores of people detained, and a social media campaign to #FreeBobiWine was launched. Dozens of top international musicians, including Angelique Kidjo and Chris Martin, signed a letter demanding his release. Museveni, who took power by force in 1986, is a U.S. ally on regional security. In 2007 he deployed Ugandan troops to help fight al-Qaida-linked Islamic extremists in Somalia, one reason many Ugandans believe Western powers are reluctant to criticize his human rights record at home. In recent years Ugandan forces have been accused by opposition politicians of harassing and torturing perceived opponents, and Museveni himself is accused of wanting to rule for life. Museveni, who is 74, is now able to seek re-election in 2021 because parliament passed legislation last year removing a clause in the constitution that had prevented anyone over 75 from holding the presidency. Security personnel entered the parliamentary chamber and roughed up opposition lawmakers, including Ssentamu, who had been trying to delay a vote on that legislation.